Businesses rely on automatic door closers to keep their building secure. When something goes wrong with one, it can mean the difference between being able to secure a building or facing a serious security issue. Like every other piece of equipment, automatic door closers can sometimes have the unfortunate habit of breaking when you least expect it. When they do, you need a company like us at 858 Locksmith to come in and find out what is going on. Our technicians are among the best in the business and our company prides itself on doing fair and honest business with its clients. In addition, all of our technicians have 5+ years experience and provide a complete locksmith service in San Diego, CA and surrounding areas. If you want fast and friendly service, you have come to the right place. 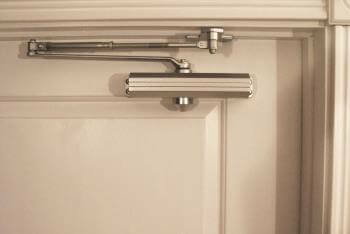 Almost all commercial buildings utilize automatic door closers. When it comes to finding a company that can install and repair them quickly and efficiently, it is important to choose wisely. You obviously want to contact a company that can provide you with up front pricing, not to mention 24/7 locksmith service. More specifically, when you call one of our expert technicians, you can expect a 30 min response time. This minimizes the chances that you will be inconvenienced by a piece of equipment that has failed at the last minute because we can repair it quickly. Moreover, our mobile locksmiths are able to provide you with knowledgeable service and they are known throughout the region as some of the most skilled individuals in the business. In fact, our commercial locksmith service is second to none. Of course, we are licensed, bonded, and insured for your safety. This means less worry on your part because you know that you can count on our company. We stand behind our services. After all, our sole reason for existence is to help our customers. When it comes to finding a company to install and repair automatic door closers in commercial buildings, we have the expertise and the knowledge to get the job done quickly and to ensure that each job that we do is performed correctly. We service all kinds of buildings, ranging from commercial structures like supermarkets and malls to government buildings, banks and any other form of commercial buildings that require this type of equipment. While we specialize in this type of service, it is important to remind our customers that we provide a complete locksmith service, so we are able to help our clients with virtually anything they need. This makes it easier on our customers because they can call us for a problem that they are having with one thing and then get many other issues addressed at the same time if they so desire. We are also more than happy to answer any questions that potential customers may have in order to help them work through all of their concerns as quickly and thoroughly as possible. No one likes to find themselves in a situation where the very integrity of their building is compromised. Once that happens, the security of everything that they do becomes compromised. Eventually, this even trickles down to personal security involving the people that are working in the building. If they do not feel secure, they become less apt to be able to do their jobs efficiently. For all of these reasons, it is vitally important that a company like ours at 858 Locksmith be contacted in San Diego, CA and surrounding areas. Whenever there is a problem, our technicians can help. Our company prides itself on being the best in the business. It is important to remember that we always offer up front pricing and that we provide 24/7 locksmith service. If you find yourself in need of installation or repair for automatic door closers, do not hesitate to contact us right away so we can help you alleviate your concerns and allow you to get on with your day to day business practices. Automatic Door Closers https://858locksmith.com/automatic-door-closers/ 4.1/5 based upon 28 reviews.